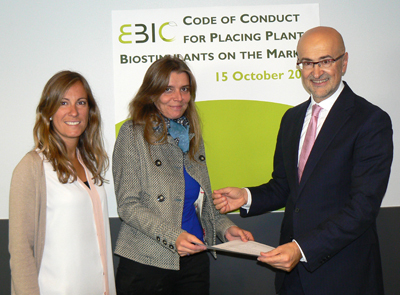 To help increase clarity in the marketplace for users, producers and consumers, the European Biostimulant Industry Council (EBIC) has developed a Code of Conduct for Placing Plant Biostimulants on the Market. Providing adequate information for end users to make informed decisions. The implementation process will be a journey, with compliance steps expected to converge towards the requirements of future EU regulation when it comes into effect. Tradecorp’s first commitment is to develop an individual compliance plan on how we will converge towards the expected EU requirements, with deadlines set accordingly. 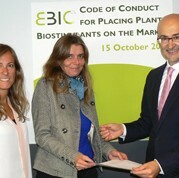 Webpage of EBIC dedicated to the Code of Conduct: http://www.biostimulants.eu/ebic-code-of-conduct/. Paz Pérez, and Pilar Gallego, from Regulatory Affairs and REACH unit in Tradecorp, and Giuseppe Natale, President of EBIC.